Henri (1603-1677) and Charles Beaubrun (1604-1692) were two cousins, whose careers are virtually indistinguishable. They were both trained by their uncle, Louis Beaubrun (died 1627), and became portrait painters as the court of Louis XIII and Louis XIV. In 1648, they were among the founders of the Académie Royale de Peinture et de Sculpture where they became professors. This painting is called portrait of Jeanne de Marigny although very little is known about her life and no other portraits of her have survived. 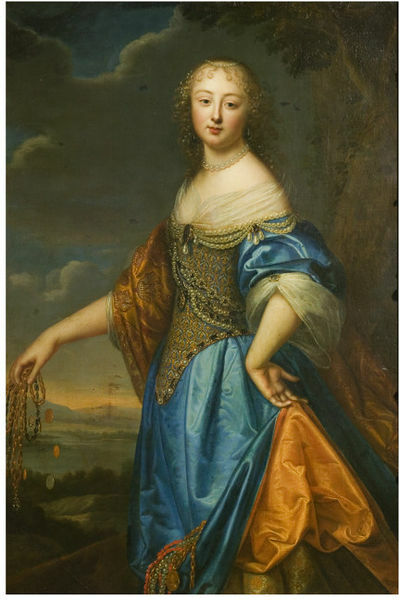 The sitter is here depicted in a lavish satin dress in blue and orange with several strings of pearls, typical of the 1650s’ fashion in France. The Beaubrun were highly regarded for their state portraits and provided a wide range of female portraits, which appears to be an important testimony of the aristocratic representation in 17th-century France although they all look quite mechanically executed. Three-quarter length full-face portrait of a lady facing the spectator; she has fair hair arranged in ringlets surmounted by a string of pearls, she wears elaborate satin dress in gold, blue and orange/red, also ornamented with pearls. Her left hand rests on her hip and holds up her skirt in which are trapped some necklaces and gold coins. From her right hand she holds out two necklaces while some coins are dropping out. In the background on the left is a landscape under a cloudy sky; on the right is a tree. 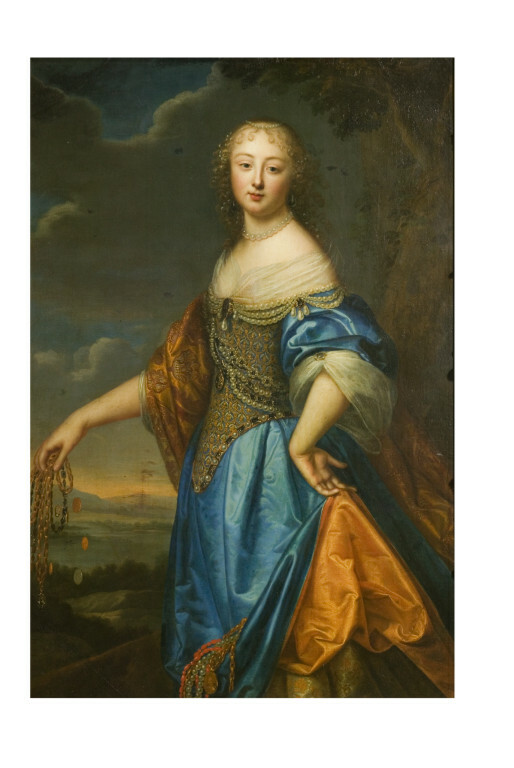 Historical significance: Formerly attributed to Nicolas (1606-1668) and then Pierre Mignard (1612-1695), Charles Sterling reattibuted this painting to Charles and Henri Beaubrun. An exact copy of 566-1882 in miniature is in the Royal collection, Windsor (RCIN 421458), and it was in fact not unusual that miniaturists copied the paintings of renowned artists. For instance, two miniatures after Beaubrun's portraits of the Queen Marie-Thérèse and the Grand Dauphin were made by Joseph Werner (1637-1710), Musée de l'Histoire de France, Château de Versailles. 566-1882 is a fine example of the Beaubrun's production of female portraits, which always present the sitter in the same position: three-quarter profile, generally facing left, with very little variations in the depiction of the long heavy hands and arms while the lines of the boneless shoulders and neck appear also very similar from one sitter to another. The background can be either a dark neutral setting or a landscape in which case it was most likely depicted by another artist. This portrait resemble very much other painting attributed to the Beaubrun, especially the Portraits of Anne of Austria with the Grand Dauphin, Prado Museum, Madrid (P02291), La Grande Mademoiselle, Musée Carnavalet, Paris, and the portrait of Claire-Clémence de Maillé, Princess of Condé, Duke of Maillé collection, Château de Châteauneuf-sur-Cher, who is depicted in a very similar blue and orange dress. The Beaubrun achieved a considerable success as court painters but their art became gradually old-fashioned during the second half of the 17th century. Although their output must have been quite prolific, only a few paintings had survived, a number of which may still be wrongly attributed to Mignard. 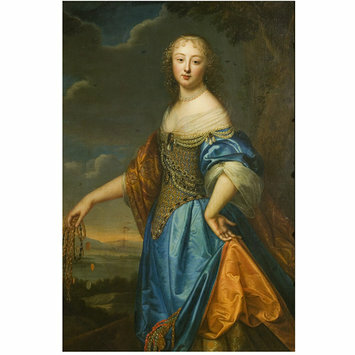 Their oeuvre appears particularly interesting from an iconographical point of view and must be therefore considered as an important testimony of the 17th-century aristocratic representation in France. C.M. Kauffmann, Catalogue of Foreign Paintings, I. Before 1800, London: 1973, p. 22, cat. no. 17. B. Long, Catalogue of the Jones Collection, 1923, p. 29 f.
C. M. Kauffmann in Apollo, xcv, 1972, p. 180, fig. 5. J. Wilhelm, 'Quelques oeuvres oubliées ou inédites des peintres de la famille Beaubrun' in Revue de l'art, 1969, 5, pp. 19-32, fig. 24. G. Wildenstein, 'Les Beaubrun' in Gazette des Beaux-Arts, 1960, 56, pp. 261-274.